With our powerful data management tool, you can capture all of your data in one place plus search, filter and organise exactly what you need to. This ensures you can maintain full audit trails and eliminate the need to re-key customer information. Define what data you wish to capture, add validation rules and settings such as spellcheck, make the changes live and LEAP will automatically create all the data entry forms on the desktop, web and mobile. Choose from a huge number of different field types including dates, pick-lists, rich text, auto-generated references, currency and more. LEAP integrates with the Royal Mail Postal Address File (PAF) service to provide full postcode lookup for all UK postal addresses with built-in proximity searching. In addition, integrated Google Maps pinpoint addresses and allow users to dive into the map with Street View. LEAP provides the ability to find what you’re looking for fast. Use custom filters and groupings to manipulate search results and uncover the data you require. Every grid can be customised and any text field can be included in a universal ‘word search’. Capture contact information and build a structured and organised database of customers, suppliers and third parties. LEAP External Accounts allow you to provide contacts with restricted access to their process for self-service and enquiries. The Activity Log captures detailed information about every action carried out in the system, including a timestamp and user profile providing a full audit trail. 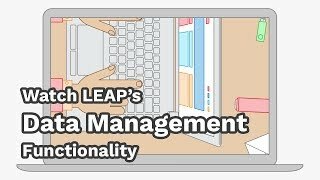 LEAP Touches allow managers to identify problem records and flag cherry-picking. Operational reports can be generated from the data to identify best and worst performing team members. LEAP includes a transactional based accounting model. Create Sales, Purchase and Nominal Ledgers with a hierarchical model of Ledger Account codes. Post transactions to the ledgers such as Invoices, Estimates and integrate with CRM for billing. Want to see how your process can be automated and optimised? Send us some details about your process and we’ll build it in the LEAP platform for you to explore. Simply get in touch to book your free demo.